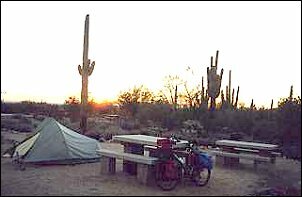 This scrapbook reflects the cycling portion of a five week hiking and biking trip in Arizona during December 2001 - January 2002. The cycling part of my trip concentrated on the southeastern corner of Arizona, starting and returning to Phoenix. I decided on this area because it sounded like there would be some interesting things to see and because I thought it wouldn't be too cold in the winter. As it turned out, there where many interesting things to see, but there were also some very cold and very long dark nights, and I ended up camping a fair bit less on this trip than I had intended. 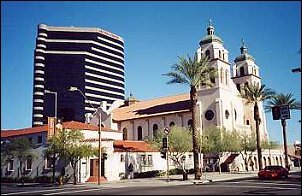 I arrived in Phoenix late on December 15th. After finding my pack and my bent and broken bike in the trashed remains of the bike box (courtesy of Delta Airlines, who had charged me US$80 on top of my passenger ticket to transport my bike), I found my way to the stop for the Blue super shuttle van outside of the airport. Half an hour later the van (US$7) took me to the Budget Lodge Motel, a decent, relatively cheap accommodation (about US$40 with tax) in downtown Phoenix. December 16th. Slept in until almost 10 AM, although I was up and awake a few times during the night, mostly worrying and checking over the damage to my bike. Spent the morning unbending a few parts and doing some other repairs, then took the bike out for a 20 km (12.5 mile) spin around Phoenix. Pumped up the tires to 60 psi - after a long search for a working air hose at a gas station (no free air in Phoenix or most places in the state. You have to put in 50 cents to get the hose to work). Then spent a lot of time adjusting my gears. Finally discovered the main problem with shifting was a broken pulley wheel, which I replaced back at the motel that evening. December 17th. White Tank Mountain Park. 57 km (36 miles) today. Decided to do a break-in run to the west of Phoenix for a few days, both for me (after too many months sitting at a desk) and for the bike, which I'm still concerned about. If I have problems with the bike - so far so good - I figure I can take it to a bike shop in the city on my way back through when I head east. If I have problems with me - well...so far so good on that one too. I'm camped in a closed off picnic area in the middle of the desert. Beautiful and lonely here. There is an official campsite in this park, but I didn't really want to be camped amongst a bunch of other people. Long tedious ride through Phoenix and suburbs and industrial/agricultural area to get here. It's great to be away from the city, even though not very far. I can see all the lights of Phoenix. During the daylight there is a distinct band of brown polution visible above the city from here. December 18th. 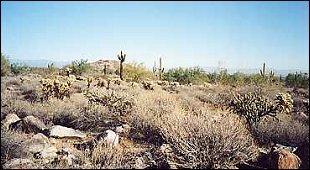 Spent the day walking in the desert and getting into being here...so different from the lushness back home in British Columbia. 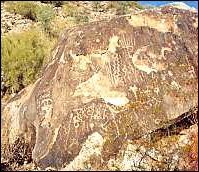 Visited the native petroglyphs on the Waterfall trail. No waterfall though; no water at all in any of the stream beds in these mountains. Tonight, at dusk, I saw a coyote near my campsite. They serenaded me all last night, counterpointed by a few owls. Saw some javelina tracks today and also lots of birds - quails, a great road runner, some kind of flicker and many others I couldn't identify. It is stark, but the landscape is definitely alive. December 19th. 7:50 AM: Mostly packed, except for all my clothes which are still on me. Nights in the desert are definitely cold. My thermometer read 1 degree Celsius at sunrise, half an hour ago. Now it's about 5 degrees C, so by the time I've had breakfast, I should be down to my bike shorts and fleece shirt. Heading back to Phoenix today. Total cycling distance today: 59 km (37 miles). My accommodation for tonight is the The Metcalf House Hostel, again in downtown Phoenix. This is decent accommodation at a decent price, especially if you are a International Youth Hostel member. Sue, the manager, is a hoot! Would have stayed here when I first flew to Phoenix, but my plane arrived after their closing time.